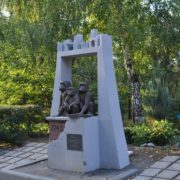 The history of the city of Kharkov is full of various interesting events and facts, one of which is the story of three Rhesus macaques that survived the German occupation. 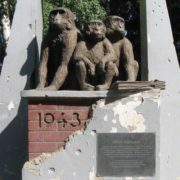 It was to these primates on the day of the city of 2008 that a monument was erected in the Kharkov zoo, opposite the monkey house. In order to clarify the situation, it is necessary to tell in a few words the story of the survival of Desi, Rosa and Hector – the rhesus monkeys, which survived the war time. Having managed to escape from the zoo before it got under the wave of high-explosive shells (one of which got into the monkey house), the macaques found their salvation in the building of the administration (Gosprom). When it was especially cold they hid in attics of the houses, and with warming returned again to their shelter. Meanwhile, their shelter became one of the offices of Gosprom, where they arranged for themselves a den in the closet. Noteworthy, in Kharkov, from the late autumn of 1941 to the spring of 1942, there was a terrible famine. 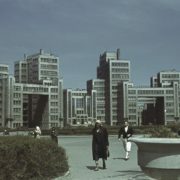 Despite the plight of the occupied Kharkov and the starvation of wartime, ordinary Kharkov residents didn’t leave poor primates in distress and tried to feed them as much as they could. There is information that a number of times policemen raided the poor rhesus monkeys, but these round-ups did not bring results. Nevertheless, once the Nazi “guardians of order” managed to find animals. Seeing the primates, one policeman fired and wounded one of the macaques. Years of wandering through the ruined city ended when, on August 23, 1943, the Red Army troops liberated the city. Monkeys returned back to the zoo. Desi, Rosa and Hector were among the few animals that survived the hard times of the German occupation. Interestingly, to return monkeys was not simple, as people managed to catch only the male. However, the next day Rosa and Desi returned to their old habitation themselves, not wishing to remain without Hector. Now the zoo is home to the great-grandchildren of the legendary trinity. By the time of the liberation of the city from the Nazis in the zoo have survived 4 bears, 5 monkeys and 1 wolf. Partly were destroyed areas for elephant, monkey, aquarium, and all fences. 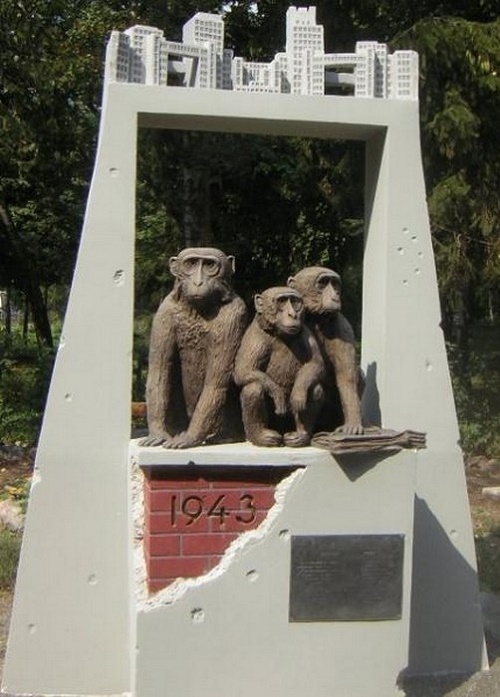 The total damage caused to the zoo by the war is 1 million Soviet rubles. The monument appeared on the City Day in 2008.